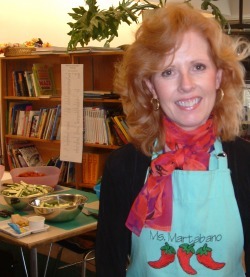 Denise Martabano is the Health, Wellness and Sustainability Coach and an elementary school teacher for the Katonah-Lewisboro School District. She chairs the Wellness Committee, acts as a resource for faculty to incorporate sustainability strategies, is overseeing the school-wide cooking events in each building, is assisting staff in pursuing a garden at each of the district's schools. She has developed and is implementing after school cooking programs for students and has also developed a wellness cooking course for staff. While teaching fifth grade for the last 16 years, Ms. Martabano has also led the Garden/Greenhouse Club and the Mexican Cooking Club. She has designed and implemented annual school wide planting, harvesting and cooking, events for her K – 5 school and co-chaired the Learning and Growing Garden Committee. Meadow Pond is entering the second phase in the installation of their outdoor Learning and Growing Garden, which includes a handicap accessible low maintenance vegetable garden, a butterfly garden, colonial garden, sensory garden, cutting garden, composting center, outdoor classroom. Denise has represent the Katonah-Lewisboro School District at the Baum Forum at Teachers' College, Columbia University. She also presented at Weschester County's "Be Fit Westchester" Summit at the Westchester County Center in White Plains. Currently, Denise is also teaching a series of courses for teachers titled "Growing School Gardens to Teach Health, Wellness, and Sustainability" at Stone Barns Center for Food and Agriculture.